Kyoto is a major city in Japan. Kyoto hosted the climate conference, which set the Kyoto Protocol in 1997. In 3003, as global warming showed its face again, another conference was held in Kyoto to discuss the matter. However, global warming was not resolved at the conference, but the order of destroying all robots was invoked by Dr. Ogden Wernstrom. 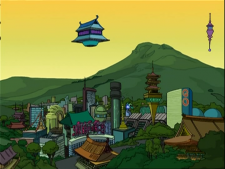 But on the Galapagos Islands, Professor Farnsworth devices an alternative solution that would avoid destroying the robots and solve global warming at the same time, by moving the Earth further from the Sun. This page was last edited on 31 August 2013, at 23:15.